Sails are fascinating. It doesn’t matter how much you learn about how they should look and be trimmed, there’s always areas you don’t understand and need to lear more about. If you’re a curious person, my job is perfect. I get to meet the world’s top sail designers, those who develop new materials like 3Di, those who write software and those who analyze real world performance like Johan Barne and Aksel Magdahl. 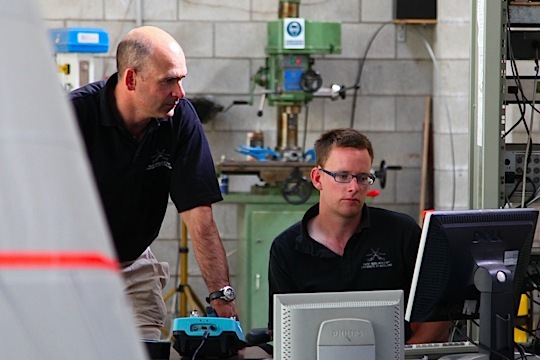 In the case of wind tunnel tests, there is one place on earth where all teams go with their yacht- and sail designers – Twisted Flow Wind Tunnel at the University of Auckland. Especially when it comes to downwind sails, many refer to their expertise and experience. And often when I meet great sailors they’ve done their master thesis here. David le Pelley manages the Yacht Research Unit and Dan Jovett who focuses on the VSPARS application (see below). The unit belongs to the University of Auckland, but is located in an anonymous building southeast of the city center. The goal is to fund their operations with commercial assignments, and given how many boat builders, VO70- and large IRC projects that uses the tunnel, it seems to work out pretty well. They host a number of student projects spanning a wide range of topics. You get a pretty good idea of ​​what you’re doing by looking at this list: Current research projects available to students. Great mix of scientific theories and practical tests. Over the years a large number of Swedish studens have been there. Every two years they organise the High Performance Yacht Design Conference. Next time will be in March. The documents from the old conferences is great bedside reading. Right now I am getting through “The effects of stay sails on yacht performance”.